After the great success of the Autumn Glow bundle, Makeup Geek released a new discounted eyeshadow bundle for the holiday season 2016. The Makeup Geek Holiday Bundle is a great selection of 9 shades, 6 matte and 3 foiled, perfect for the holiday season. In this video I swatch the shades, give you my opinion and show you two easy makeup looks you can do with these Makeup Geek eyeshadows. Oh I am so behind on this series, I apologize. We are now on the third palette for my #OnePaletteOneWeek challenge as a part of the #100DaysOfMakeup challenge I’m doing and we’re talking about the gorgeous Lime Crime Venus II palette. If you’re new around here, in this series I wear only one eyeshadow palette for a whole week and try to come up with different looks each time. This allows me to push myself to be creative and at the same time give more love to all the eyeshadows in my collection. To catch up on the other episodes, click here. Welcome to the second week of my #OnePaletteOneWeek challenge. If you missed the first one, check it out here. This week I used exclusively the Juvia’s Place Masquerade Mini palette to create six makeup looks. I was super excited for this palette, pre-ordered it immediately and have not been disappointed! I’ll leave you with a mini-review at the end of this post. I have a lot of makeup, and a lot of eyeshadows for that matter. I know, shocking huh? Well, to make sure all my eyeshadows get some good use, I decided to start the #OnePaletteOneWeek challenge. Ok, it’s not an official challenge, but I want to challenge myself to change it up a bit and stop wearing always my same 10 Makeup Geek eyeshadows all the time. So since last week I decided I am going to use only one eyeshadow palette for one whole week and try to vary the eye looks as much as I can. The first palette I picked for this challenge is the stunning Lime Crime Venus 1 palette which I showed you in my latest haul (here). Ok, not so adventurous you’ll say, colors you always wear Alice. That’s very true, but I wanted to ease myself into it. The palette is absolutely stunning and after wearing it for a week every day, I also have a mini review at the end of this post. The latest Makeup Geek release of the collaboration palette with MannyMUA broke the internet at the end of February and pre-orders for the restock are expected to take 4 to 6 weeks to ship (link here). Crazy stuff. I am a huge fan of the brand and have a big collection of their single eyeshadows (here) so I was immediately ready to jump at the first pre-order newsletter. Then I looked at what it would cost me in terms of value (45$) and custom costs (? ?€), as well as the price to pay if I got it from BeautyBay (63€) made me take a second look at my stash. The palette also contains 3 shades from the permanent line that I already own. So after longing for the palette I put together my own version of it with the shadows I already own which are the exact ones from Makeup Geek’s permanent line or what I believe are close enough dupes for the exclusive shades. Let’s take a look at what I came up with. 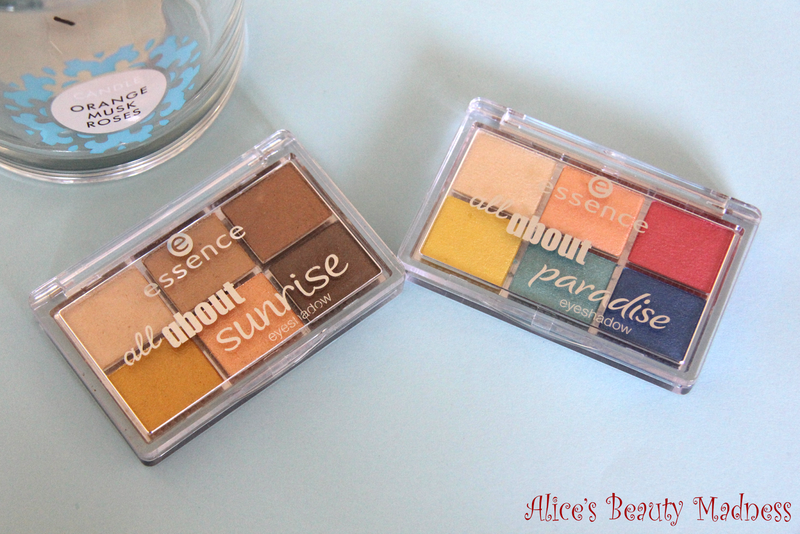 Today I bring to you two gorgeous and exceptionally affordable eyeshadow palettes from Essence: All about Sunrise and All about Paradise. Each palette contains 6 eyeshadows and you can find these and 2 more of this range in Kruidvat or your local drugstore for 3.59€, hardly beatable is it? Let’s take a look at these babies! 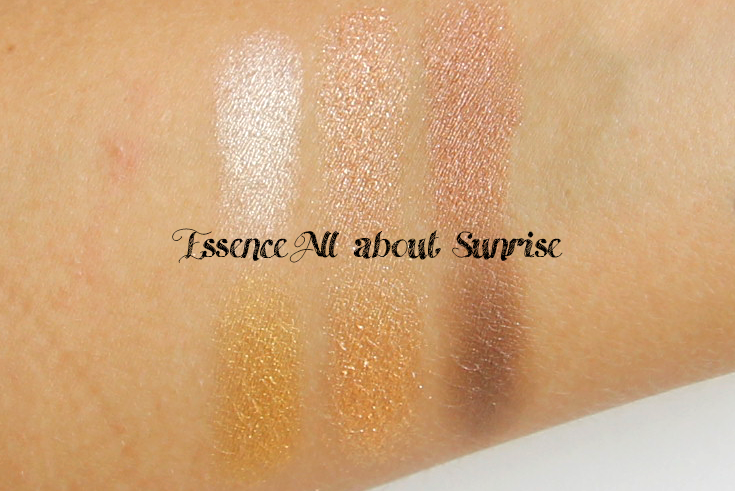 Starting from the more neutral palette, Essence All about Sunrise has all the shimmering goodness that you’ll ever want ranging from gorgeous champagne to golds and bronze colors. Starting from the top left you get a bright champagne, a lovely peach and a pinky-light brown. On the bottom row instead two golds with different undertones and a darker warm brown. I adore this palette and it is packed with a lot for shades I use on a daily basis in combination with a few matte shades from other palettes. Typically I put the first shade on the top in the inner eye as highlight and then any of the other shades all over the lid in combination with a matte brown in the crease. Really happy with this one! Second let’s look at this gorgeous colored palette! 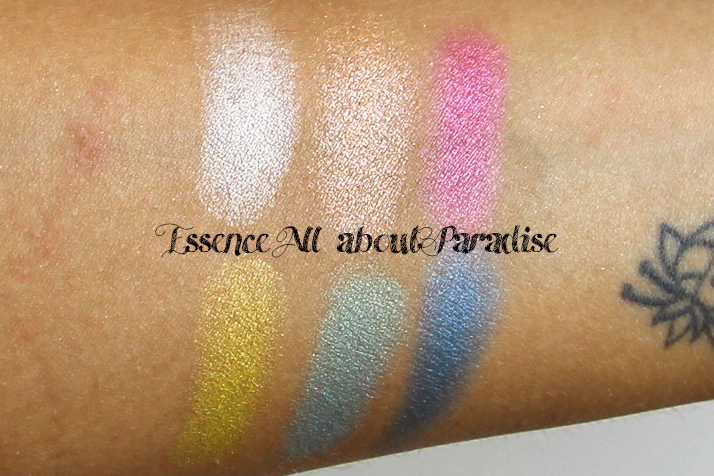 In the Essence All about Paradise palette you get your champagne highlight color and then a peach and a bright fuchsia on the top row, while on the bottom we find some seriously pigmented yellow, teal and blue. I was very surprised to find such bright colored palette in the drugstore and with such good quality and pigmentation! This is a great palette also for those of you who don’t wear colors too often but need something for those sunny days when you do! Overall I really recommend these two palettes and for the price you cannot really go wrong! 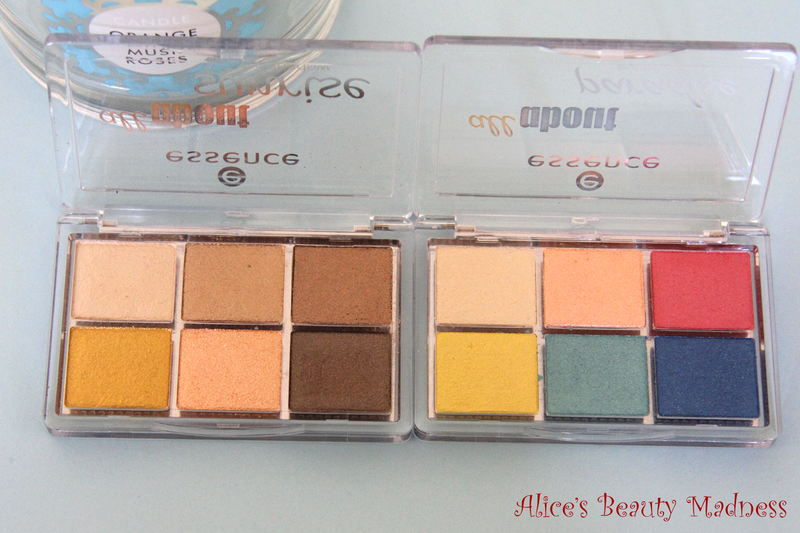 The quality and the pigmentation are really good and really impressed me for eyeshadows from the drugstore!